An FIU alumna has been appointed fire chief of Fort Lauderdale – the first woman to serve in this role in the 106-year history of the city’s fire department. Rhoda Mae Kerr MPA ’93, who currently serves as fire chief of Austin, Texas, will return to South Florida in July 2018 to lead the department that gave her a start as a firefighter in 1983. A New Jersey native, Kerr is a fourth-generation firefighter preceded by her father, grandfather and great-grandfather. Her family’s history in the profession dates back to when firefighters still drove horse-drawn carriages. But Kerr started her adult life on a different path: She was teaching physical education and health and coaching sports when she realized, at the age of 33, that she wanted to follow in her father’s footsteps. This led Kerr to FIU, where she earned a master’s in public administration at the recommendation of a colleague who had also completed the program. She knew it would give her the knowledge of the public sector that she needed to pursue leadership roles. Kerr attended classes at night and on Saturdays while working full-time (24 hours on and 48 hours off) as a battalion chief for the Fort Lauderdale Fire-Rescue Department and part-time in a restaurant. “I’m one of those people who has lots of energy, and I just make it happen, and I don’t let anything stop me. I just keep moving forward. I guess it was challenging, but of course, we’re talking about how many years ago? And I just didn’t really look at it as too difficult,” Kerr says. Above all, her classes helped her see how different departments in the public sector can work together for the common good. After more than a decade away from South Florida, Kerr is looking forward to her homecoming. She spent two decades with Fort Lauderdale Fire-Rescue, working her way up to deputy fire chief. She then moved to Little Rock, Arkansas, to serve as chief, followed by her most recent position as fire chief of Austin, Texas. She feels her time away, and her experience leading Austin’s department of more than 1,100 employees, will offer invaluable insight as she leads Fort Lauderdale Fire-Rescue. “I know that I am a far better chief now than I would’ve been 13 years ago,” Kerr says. Kerr’s duties as fire chief vary. In addition to administrative duties such as overseeing staff, budget and facilities, she spends time out in the community representing the fire service. Earlier this month, for example, she read to elementary students celebrating Dr. Seuss’s birthday and taught them about being a firefighter. Fort Lauderdale’s is not the only glass ceiling Kerr has broken in her 35-year career. She was also elected president of the International Association of Fire Chiefs in 2015, becoming the organization’s first female president since its founding in 1873. The IAFC helps develop policies and standards for the fire service at an international level. In the year she was president, she travelled all over the world to speak about her experience as a woman in the fire service and to discuss best practices in the profession. She also had the opportunity to stand up in Congress to testify about matters of national importance like homeland security and emergency management. “Every firefighter in the world, no matter where I went, believes the same thing. They love what they do, and they care about the people they serve,” Kerr says. In addition to paving the way for women in her profession, Kerr uses her platform to champion workplace equality. The Austin Fire Department boasts twice the number of females on its force as the national average. 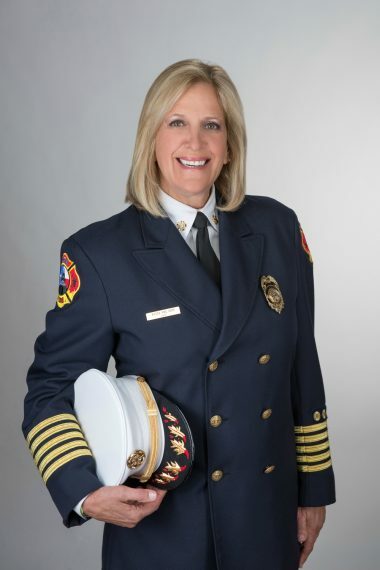 In her time as chief there, as well as in her former role as fire chief in Little Rock, Ark., she has worked to change the face of the force by advocating for gender-neutral facilities in fire stations, hiring more qualified women, ensuring that women have uniforms and equipment that fit, and working on policies that are fair to all employees. She also takes the time to mentor other women. Finally, as fire chief, Kerr reminds everyone to check the smoke alarms in their homes to ensure they’re working.